Home → Is your site a Billboard in the Woods? Conduct a simple test. Is your site a Billboard in the Woods? Conduct a simple test. 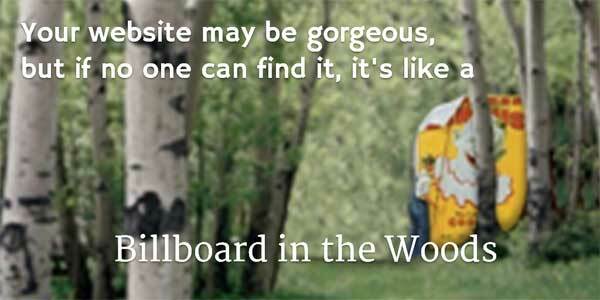 Is your website like a Billboard in the Woods? It’s easy to find out! Just take our little test. It should only take you a couple of minutes to learn whether potential new customers can find you. Think like a customer who wants your most important or most profitable product or service but doesn’t know the name of your business. Try to look up your own web site online just like that customer would. Does your web site show up in the first 10-20 listings? Is it in the first page or two of results? Do you show up in the Local 3-Pack? That’s the map with three listings and map pins showing where they are. If not, new customers aren’t finding you. People don’t have the patience to scroll through page after page of listings to find your business. For potential customers to find your site, you need to get it into the top one or two pages in Google for most of your important keywords or search phrases. And the way to do that is with search engine optimization (SEO). Rank Magic is an SEO company that’s an expert in exactly that. Ask how we can help with your website’s visibility.